My Tea Shelf is a Seattle based one-woman business. Cristina Pulido has a background in design, but had a passion for flavors and aromas, which prompted her to pursue this venture. She designs and hand stamps all the packaging herself. The packaging and the presentation of the tea is very aesthetically pleasing. One of the unique qualities of My Tea Shelf is the incorporation of Latin American flavors and non-traditional ingredients in the blends (penela, cloves, carrot bits, basil etc.). 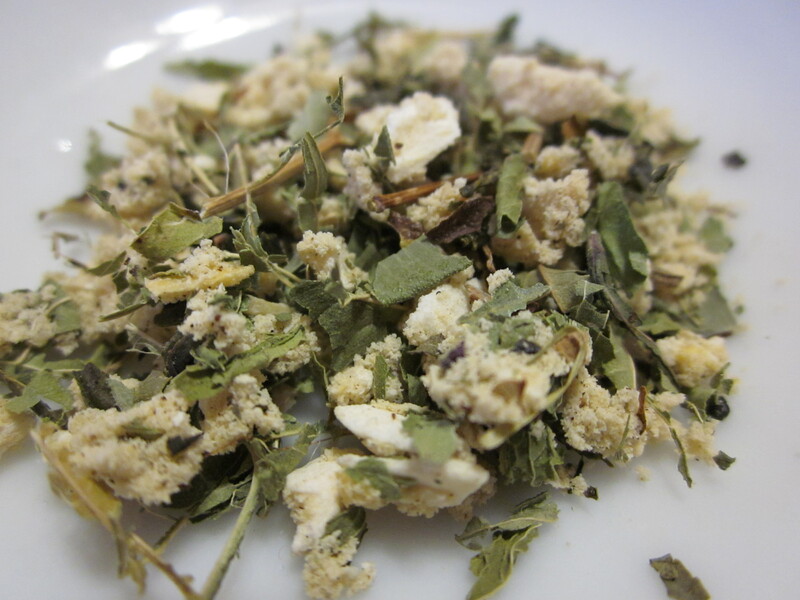 The majority of the blends are herbal infusions, though there are a few tea blends, such as Refreshing Sencha. Refreshing Sencha, like all of the blends at My Tea Shelf, is a beautiful blend to look at. The dry leaf smells herbaceous and citrusy. The blend consists of organic lemon verbena, dried mango, organic peppermint and spearmint and vanilla sencha green tea. The infusion comes out a fantastic bright yellow and has a strong minty-lemon aroma which is quite nice. Although I am generally more a fan of pure, unadulterated teas, I do enjoy some blended teas very much. For instance, sometimes Earl Grey is just the only thing that can satisfy me. Also, a creamy Masala Chai or a good Moroccan Mint tea can’t be beat. This blend sort of reminds me of Moroccan Mint, with a fruity, citrus kick. The flavors are very bright and slightly sweet. It has good body and a nice green tea base of flavor. The sencha does take a backseat to the mango, mint and lemon verbena, but it gives the infusion balance. I iced some of this tea, and added a bit of lime and fresh mint and it was fantastic! Teaopia is a Canadian retailer of loose leaf tea, tea-ware and accessories. They have a wide selection of teas that number over 100 varieties. I recently visited my local Teopia in the Fairview Park Mall in Kitchener, ON. The staff were very friendly, helpful and knowledgeable and pleasantly accomodated my extended lurking and questions (thanks!). I love this company. My only wish is that they add a few more good Oolongs (Wen Shan Bao Zhong anyone? ), great black teas from China (Golden Monkey) etc. I am just not feeling the flavored teas as much lately. I still think they have their place sometimes, I am just so interested in pure teas and the natural flavor profiles that come from the terroir, the particular strains of cameilla sinensis etc. So, this tea is called Jade Snow Green Tea. The dry leaf is very attractive, with downy white tips throughout. The scent is pleasant, but very light, a slightly grassy and lightly floral nose. I steeped my tea in a gaiwan, which is my first choice when doing my tastings these days (it’s a 99cent gaiwan from Chinatown!). The liquor presents light yellow, and has a bouquet of savory vegetal notes, a bit of a honeysuckle scent and a light stone-fruit quality. The tea smells sweet and is very enticing. Initially the taste is light but it gradually opens up as it reaches the rest of your palate. The flavor is bright and fresh with a little briskness on the finish. A little bit of citrus rind too, which gives balance and complexity to the flavor profile. This tea has “that thing” about good green teas that I just love so much. It’s kind of indescribable but it’s the savory, soup-like quality that is so soothing and satisfying on a level beyond just taste. It’s an experience. It seems like forever since I last posted. And it really was a long time ago. I have been very busy, and while tea is still a passion of mine, and I still drink tea with fervor and curiosity, I haven’t written about it. But I am back, and I hope to be a much more prolific blog writer in the next few months. Matcha. One of my absolute favorite teas. I love it hot and strong, and I love a good matcha shake. But matcha is very expensive and I don’t often buy it in any significant quantity. Mellow Monk‘s matcha-style green tea (made from sencha), though, is an excellent value. $16.95 for a 95 gram packet really is incredible, as most matcha costs at least double that price. The low price doesn’t make me worry about quality, I trust Mellow Monk to deliver exceptional product. I reviewed their Top Leaf Green Tea a few months back and it was very fresh and tasted fantastic. The great thing about matcha (and matcha-style teas like this one) is the fact that is as much an aficionado’s tea as it is not. Teenagers love shakes and bubble/boba tea infused with matcha powder and their parents are drinking it for the high antioxidants and nutritional content. 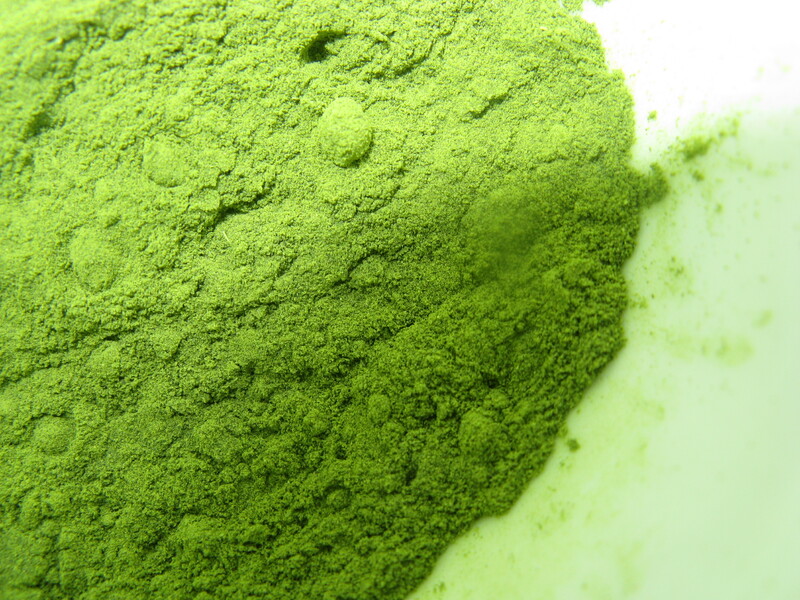 But matcha is a revered ceremonial Japanese green tea, and the highest quality matcha can be quite expensive. Whoa this tea is green! I enjoyed the color and the slightly sweet, uber-green tea taste. This is green tea extreme. There are grassy notes, great body and fantastic bright flavors. The tea’s bouquet is fresh and slightly fruity. Unfortunately, I don’t have a chasen (bamboo matcha whisk), so I wasn’t able to froth the liquor very well. Regardless of this fact, it was lovely. It is reminiscent of matcha, with its punch and strength, but truly tastes like an intensified top-notch quality sencha. I would highly recommend this tea, as I am a huge fan of Mellow Monk, and I think that at this price point, this is the best matcha-substitute that you can buy. Sure, it might not taste exactly the same, but I would personally rather drink this, a high-quality powdered sencha than a low-grade matcha. I can’t wait to make a “matcha” shake with this. I found an interesting video depicting the Japanese tea ceremony that I thought I would share. Enjoy. EnjoyingTea.com is one of the top tea retailers online. I was fortunate enough to receive several samples from them a few weeks ago. Among these samples was this Osmanthus Oolong. Osmanthus is a flowering plant native to parts of Asia. This Oolong tea is blended with high quality golden Osmanthus and provides the prominent floral fragrance and flavor to this tea. 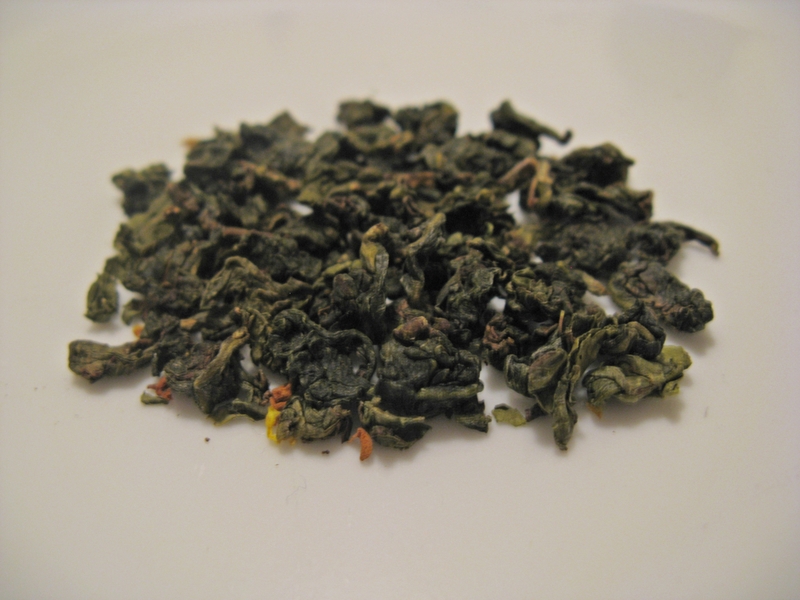 The dry leaf is a typical balled Oolong shape, with yellow Osmanthus petals scattered throughout. 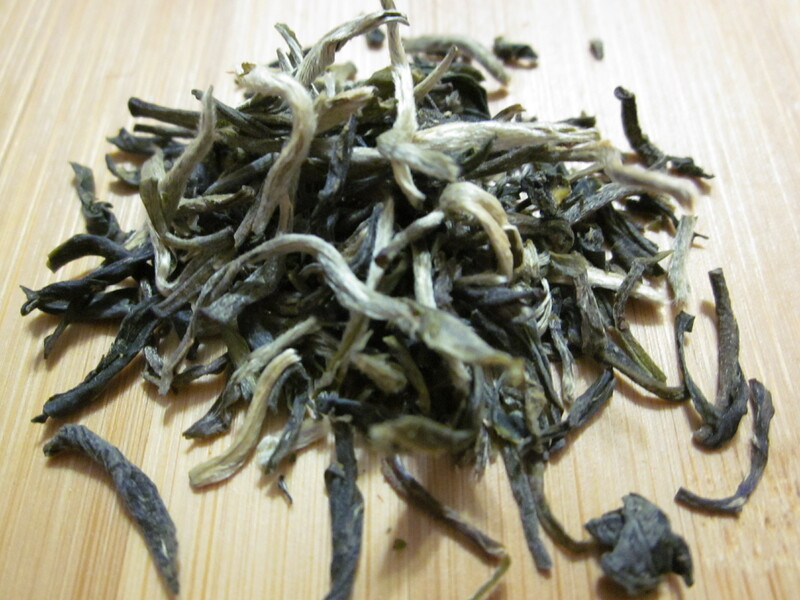 Is smells sweet and floral, and has a nutty aspect that is characteristic to many Oolongs. After steeping, the liquor is a greenish yellow and has a captivating fragrance. The floral characteristics are prominent in the nose. 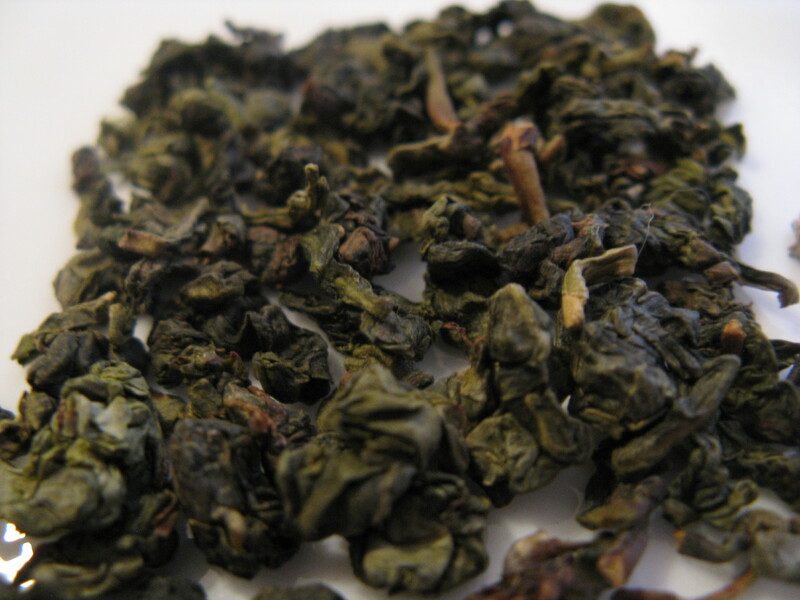 There is also the fresh, green (but not vegetal) aroma typical of a good Oolong. What a perfume. I could smell this all day. Tasting the liquor was a delight. It is smooth, floral, medium bodied and has a long finish. There are strong floral notes from the Osmanthus, which was intensified by the natural florality of lighter oxidized Oolongs. There is a very slight woody flavor coming through, along with some sweetness, mostly on the aftertaste. EnjoyingTea.com has impressed me again. This tea is easy to drink, delicious, and steeps multiple times. A tea to share over conversation and company certainly, but also a great tea in solitary. WhiteAugust Tea offers some amazing and unique tea blends. I have found, that many tea companies carry the same blends, probably from the same wholesaler. That’s fine. But it really is nice to see some original flavors. So, My Happy Place is a tisane, a dreamy herbal blend containing chamomile and banana. Seems a perfect fit for a night like this, a sweet sleepy-time cuppa to relax my mind and body before I have to go back to work tomorrow. Aromas of toffee, caramel and creamy banana waft from the package. It smells like dessert. It smells like banana-nut muffins. Caramelized sugar and shortbread cookies, a little graham cracker, and the chamomile blends with these aromas seamlessly. The infusion is a warm yellow-orange color. The fragrance is initially chamomile, then I smell unripened banana and a bit of citrus. It’s very pleasant, very soothing. The blend is aptly named, as I think I’m getting there. On the palate, it feels and tastes reminiscent of warm apple juice to me. It doesn’t taste overtly apple-y, but there is something about the body and parts of the flavor profile that initially reminded me of warm apple cider. 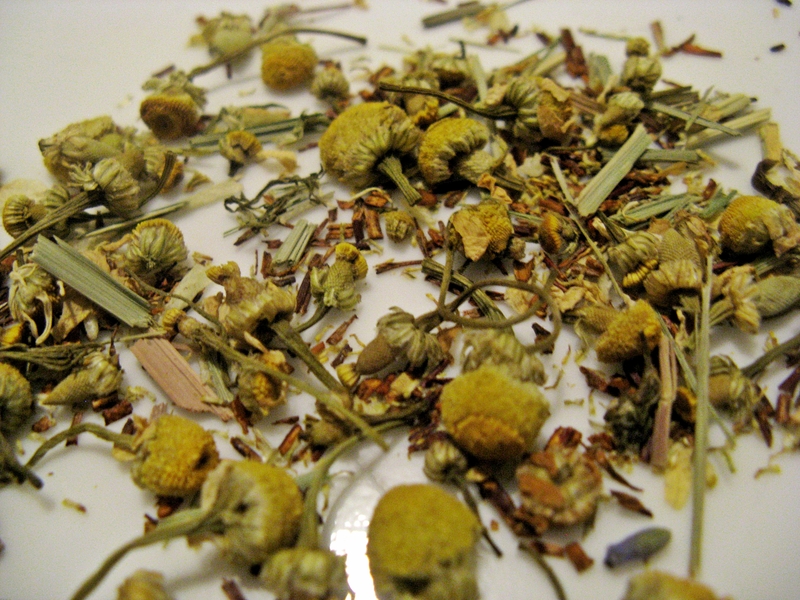 The chamomile is the primary flavor, but the flavor of bananas, vanilla and caramel are lingering in the background. There is no astringency, and it’s slightly naturally sweet and smooth-drinking. I am generally not much of a herbal-tea drinker. For no particular reason other than they don’t seem to interest me as much as true tea does. But I am surprised how I have been enjoying a lot of these blends. When I reviewed Mama Tea’s blends, I found I surprisingly loved every single one of them, especially “New Mama”. Regardless of herbal teas not being “true teas”, I think that these blends absolutely have their place in the tea world. The numerous and varied health benefits and lack of caffeine aside, herbal teas are delicious. My Happy Place proves this point very well. I love DAVIDsTEA, it’s like the “kid in a candy store” feeling for me when I go there. When I was on my Christmas vacation, I spent some time in Toronto with my girlfriend Racheal. We were on Queen Street, and shopping for my family. I saw DAVIDsTEA and knew it would be the perfect place to find a gift for my sister Erica and my Mom, Donna. They are both foodies and tea fans just like me. At the time, I was kinda new to tea, but I walked in that store and something just clicked. I loved it, the design, the aromas, the whole aesthetic appealed to me. Now I am a tea fanatic. Literally. So, I went to the new store in West Edmonton Mall on Monday and picked up the Quangzhou Milk Oolong (and the Tuo-Cha Bonbons I reviewed recently). I have previously only tried one Milk Oolong before this, the one from iN-TEA which I reviewed here. Quangzhou Milk Oolong, in it’s dry form, smells sweet, floral and buttery. It’s really interesting. It reminds me a little of popcorn seasoning with a salty, buttery aroma. There is a delicate, creamy fragrance that is inviting and kind of entrancing. When you smell this tea, you have to have it. Like, now. The liquor is a light golden yellow and has aromas of orchid and jasmine off the top. Initially it smells quite like Ti Guan Yin or other, similar Oolongs. Then a sweet milky fragrance hits my nose with a bit of exotic spiciness. So intriguing. I take the first sip and I am enveloped by a plethora of flavors. Creamy butter and lingering floral notes, with a sweet finish and a tinge of vegetal flavor. I am also finding the tea somewhat reminiscent of the Silver Needle teas I have tasted recently, delicate white tea notes with a hint of stonefruit. It has good body and a full, slighly oily texture and mouth-feel. Quangzhou Milk Oolong is an incredible Oolong with many layers. I would recommend this tea to any Oolong fan, and even those just getting into tea. It’s a great introduction to the complexity and versatility of tea. It is now one of my absolute favorites. DAVIDsTEA is a fast growing chain of tea boutiques in Canada. Founded by David Segal in 2008, DAVIDsTEA has grown from an online store and a storefront on Queen Street in Toronto to 12 stores across the country in less than two short years. They offer a permanent collection of over 135 teas and tisanes as well as seasonal collections of tea. The recently launched Spring collection this year boasts 7 unique blends, from Irish Cream flavored black tea to the herbal concoction called “Pink” with camomile, lavender, hibiscus, fennel and orange peel (among other ingredients). Another new item added to their permanent collection recently are mini Tuo-Cha Bonbons. The Tuo-Cha Bonbons are attractively packaged, looking like candy wrapped in paper, as the name suggests. 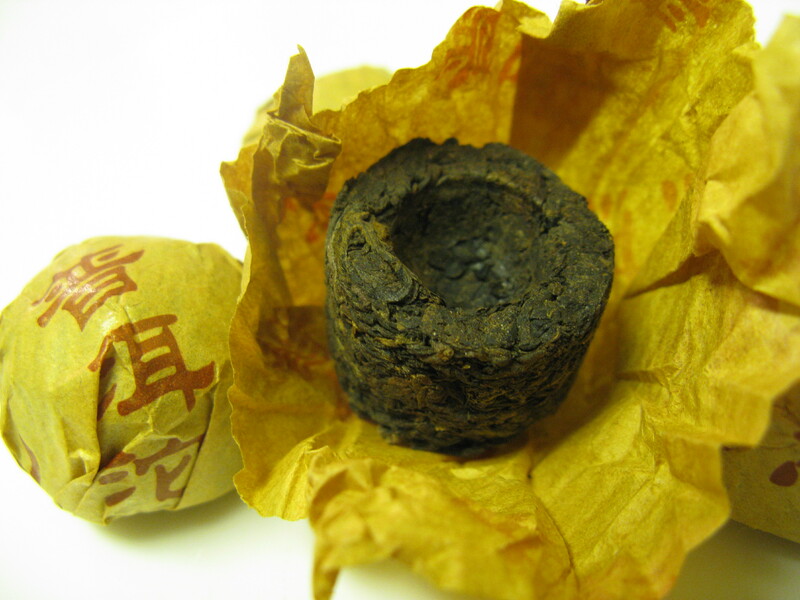 Inside the wrapper is a cute little bowl-shaped formed Pu’erh tea, shaped like a birds nest and ready for steeping. Not much aroma is present when the bonbons are in dry form. So, unlike other tea tastings I have done, I have no indication of how this tea is possibly going to smell or taste when it is brewed. Well, it looks like I am in for a surprise! The tea liquor is dark and coffee-brown and is very rich in appearance. The aroma is extremely earthy, smelling of a damp forest. I know how that sounds, but it is not unpleasant at all, just interesting. There is a bit of sweetness and the deep fragrance that’s reminiscent of a roasted, slightly smoky green tea. On the palate, the first infusion has a nice full body and is rich and substantial. There are notes of earth (dirt) and a kind of smoky, roasty, woodsy flavor. It’s minerality provides an almost salty sensation in the finish. I steeped this tea several times and I found the flavors changed a bit, the earthy flavors become more subdued and a subtle spice and citrus-rind characteristic appears at about the third infusion. At the fifth infusion, the liquor starts losing quite a bit of color and potency. Pu’erh is often said to be the tea that can convert the coffee drinker, because of the rich color of the cup and the robust flavors. I think this might be true. I am definitely curious about Pu’erh and really want to get my hands on more of it. I find this Tuo-Cha by DAVIDsTEA to be a great introduction to the world of Pu’erh for its drinkability, its complexity and its uniqueness.